 Get fit and have fun – give your brain and body a workout! 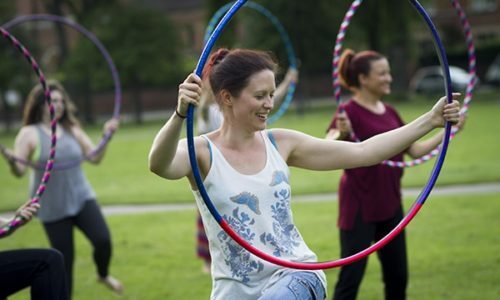 Mixing hula hooping and exercise moves, our 45 minute Hula Fit exercise classes will get you hooping and sweating! Not a fan of the gym – (you feel like everyone’s looking at you right?) – or feel like exercise is boring? We hear this a lot! How good would it be to enjoy moving and keeping fit? 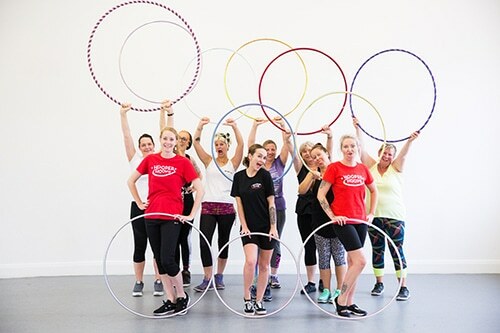 Hula Fit is a fast paced class that uses the hula hoop as a tool to work all parts of your body (not just your core!). We break our class down into segments to change up the pace, the parts of the body you’re using and to mentally keep you on your toes too! Please consult with your doctor before undertaking any new exercise. 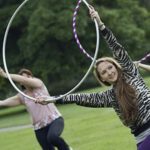 PLEASE NOTE: Spaces are limited each week for these hula hoop fitness classes. Payment can be made on the night but please email using the form on the right, to book in first. 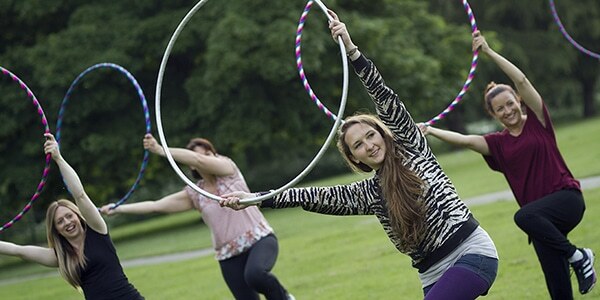 Lyndsay has been trained by the Hula Fit team to bring you hula hoop exercise classes. 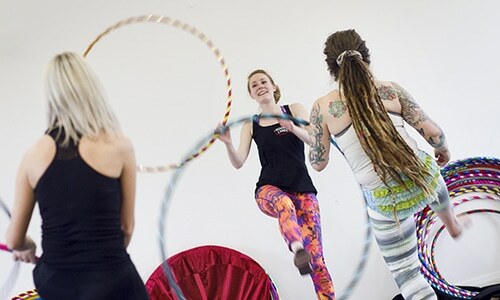 No previous hooping experience is necessary, complete beginners are welcomed. Hula hoops are provided but feel free to bring your own along if you have one. NOT suitable for people with lower back problems or ladies who are pregnant! These are some of the most frequent concerns I hear. Don’t fret! Every person in class is a different age, weight, body type. There is no right or wrong type of person to do this class. If you want to give it a go then come along. You’ll be given variations on a type of exercise to make it easier or harder so you can chose what’s right for you. You are encouraged to take it at your own pace and if you don’t feel right then to stop. I can’t even waist hoop! Can I do this class? YES! You most certainly can. You may spend a lot of time picking up the hoop to begin with but this doesn’t matter, you are still exercising. 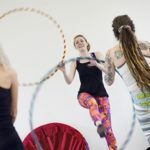 Many of our students who attend this class have little or no experience with wait hooping when they start and get better each time they attend the class! How are these different from your other classes? 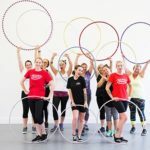 These are 45 minute fitness, exercise classes designed to make you out of breath, a bit sweaty and a bit achey, to really give your body a workout with and without the hoop rather than learning circus style tricks. They are fast paced and energetic sessions and will hopefully help improve your core strength and coordination if attended regularly. Something comfortable, and easy to exercise in. You will hopefully sweat so something you don’t mind getting sweaty in and comfortable footwear such as trainers are compulsory. An open mind, a positive attitude and a bottle of water. Hoops will be provided but bring your own if you have one. Some attendees bring a towel as there is a shower available down stairs, or just to mop up the sweat! I have a medical condition. Are these classes suitable for me?  We need to know numbers for health and safety each week so the hall doesn’t become over crowded so we currently don’t provide drop in sessions. Please email us to book your space or email us on the day incase someone drops out! 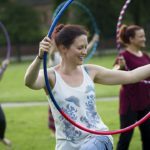 Hula Fit is great fun.  Lyndsay is welcoming, always positive and an awesome teacher – one of the best out of all my fitness instructors over the years. She has a lovely manner with everyone ranging from twenty year olds to me in my mid sixties. Hooping is a joyful thing to do. I thoroughly recommend it. Give it a go!